This ammo can is an amazing value for high-volume AR-15 Remington shooters. Each reusable steel can contains 840 rounds of .223 Remington ammunition pre-mounted on stripper clips (compatible with USGI, PMAG, and other AR-15 magazine types). These cartridges are manufactured by a top South Korean defense contractor that builds all of its own components including the non-corrosive Boxer primers and brass cases. Each round fires a 55 grain full metal jacket bullet (boat-tailed for added stability in flight) at about 3,200 feet per second. 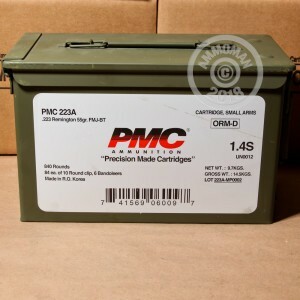 AmmoMan.com is the best place on the Web to get bulk ammo cans like this one! We ship every order over $99 for free regardless of weight, saving you a ton of money on large orders. 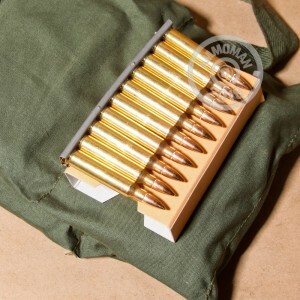 Great ammo packaged on stripper clips in bandoleer's. Great for a bug out stash. I keep several cans on hand. This is my ammo of choice.